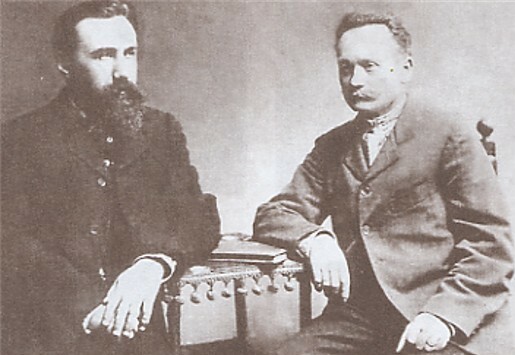 Hrinchenko, Borys [Грінченко, Борис; Hrinčenko], b 9 December 1863 at Vilkhovyi Yar khutir in Kharkiv county, d 6 May 1910 in Ospedaletti, Italy. Prominent public figure, educator, writer, folklorist, and linguist. The best known of his numerous pseudonyms are P. Vartovy, V. Chaichenko, B. Vilkhivsky, and L. Yavorenko. For 10 years he taught in elementary schools in Kharkiv gubernia and Katerynoslav gubernia. He made an effort to teach children their native language and also wrote some of the first Ukrainian-language school textbooks. He was one of the founders of the Brotherhood of Taras in 1891. In 1894 he settled in Chernihiv, where he worked at the gubernia zemstvo office and was active in the local hromada. With I. Cherevatenko's financial support, he organized there the largest publishing house in Russian-ruled Ukraine, which published 50 popular-educational books despite severe censorship. In 1902 he moved to Kyiv, where the Hromada of Kyiv entrusted him with the task of compiling a dictionary of the Ukrainian language. In 1906 he became a coeditor of the newspaper Hromads’ka dumka and the monthly Nova hromada. He founded and was first president (1906–9) of the Kyiv Prosvita society. In 1904 he was a cofounder of both the Ukrainian Radical party (Kyiv) and the Ukrainian Democratic party, which merged in 1905 to form the Ukrainian Democratic Radical party. Hrinchenko's dedicated service to the populist cause began in the 1880s when the prospects of success appeared dimmest. It consisted mostly of journalistic and community work aimed at shaping, in Hrinchenko's words, ‘out of the Ukrainian nation one nationally conscious, enlightened community’ that would have access to all the achievements of culture and would overcome the gap between the common people and the intelligentsia. His later convictions were formulated in the program of the Ukrainian Democratic Radical party, of which he was the author. 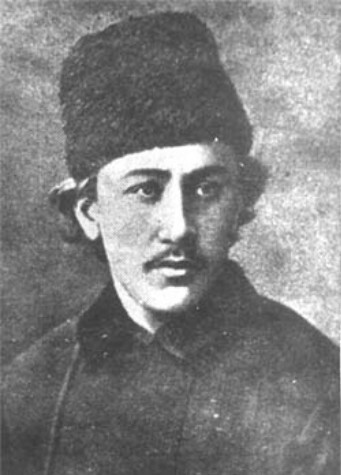 Among his publicistic works, ‘Lysty z Ukraïny Naddniprians’koï’ (Letters from Dnieper Ukraine, published in the Chernivtsi weekly Bukovyna in 1892–3 and separately in Kyiv 1917 under the pseudonym P. Vartovy) is particularly important. Hrinchenko expounded his ideas, based on years of pedagogical and community work, in the books Na besprosvetnom puti (Ob ukrainskoi shkole) (On the Darkling Path [On Ukrainian Schools], 1906) and Pered shyrokym svitom (Before the Wide World, 1907), as well as in numerous articles in the popular press. He died of tuberculosis and was buried in Kyiv. His funeral was a day of national mourning. Hrinchenko's literary work was directly linked with his journalistic work and was to a large extent subservient to it. In his 50 realistic short stories and tales and particularly in his four novelettes—Soniashnyi promin’ (The Sun Ray, 1891), Na rozputti (At the Crossroads, 1892), Sered temnoï nochi (In the Dark Night, 1901), and Pid tykhymy verbamy (Under the Quiet Willows, 1902)—he depicted Ukrainian peasant life while raising urgent social questions, the attitude of the intelligentsia to the peasantry, the education and denationalization of the rural population, and the relation between nationalism and radicalism or socialism. ‘Sad scenes’ of peasant life, dedication to the cause of the people, and the pathos of public duty are the dominant themes of his poetry, which first appeared in 1891. Some of Hrinchenko's plays are historical—Stepovyi hist’ (The Steppe Guest, 1898) and Sered buri (In the Midst of a Storm, 1899). Others deal with everyday, practical issues—for example, Nakhmarylo (It Has Become Cloudy, 1897), Arsen Iavorenko (1901), and Na novyi shliakh (Onto a New Road, 1906). Because of their relevant social content, Hrinchenko's works were very popular in their time, but have become dated. The author's practical motivation accounts for the schematic style of his works. Hrinchenko also translated a number of works by Western European writers including Johann Wolfgang von Goethe, Johann Christoph Friedrich von Schiller, Gerhard Hauptmann, Henrik Ibsen, Arthur Schnitzler, Octave Mirbeau, and Daniel Defoe. Hrinchenko was a noted Ukrainian ethnographer. His major contributions in this field are the large, well-annotated collection Etnograficheskie materialy, sobrannye v Chernigovskoi i sosednikh s nei guberniiakh (Ethnographic Materials Collected in the Chernihiv and Neighboring Gubernias, 3 vols, 1895–9); a collection of Ukrainian folk tales and stories, Iz ust naroda: Malorusskie rasskazy, skazki i prochee (From the Mouths of the People: Little Russian Stories, Tales, Etc, 1900); and the first bibliographic guide, Literatura ukrainskogo fol’klora (1777–1900) (The Literature of Ukrainian Folklore [1777–1900], 1901). His interest in ethnography led Hrinchenko to collect material for a dictionary. He incorporated much of this material into the 68,000-word, four-volume Slovar ukraïns’koï movy (Dictionary of the Ukrainian Language, 1907–9) that he edited, which contained also materials collected by Panteleimon Kulish from 1861 on, the Hromada of Kyiv, and the editorial board of Kievskaia starina. The dictionary is based on ethnographic records and excerpts from literary works published mostly between 1798 and 1870; almost all of it is documented. Until recently it was the fullest Ukrainian dictionary of its kind and one of the outstanding dictionaries in Slavic lexicology. It is prefaced by Hrinchenko's valuable survey of Ukrainian lexicography. Hrinchenko was involved also in the development of the literary Ukrainian language. In such articles as ‘Halyts’ki virshi’ (Galician Poems, 1891) and ‘Kil’ka sliv pro nashu literaturnu movu’ (A Few Words about Our Literary Language, 1892) in Zoria (Lviv), he objected to an excessive infiltration of Western Ukrainian elements into the standard language (see Standard Ukrainian) based on the dialects of Dnieper Ukraine. In accordance with his populist orientation, Hrinchenko took the comprehensibility of an expression to the common people as the main criterion for its acceptability. 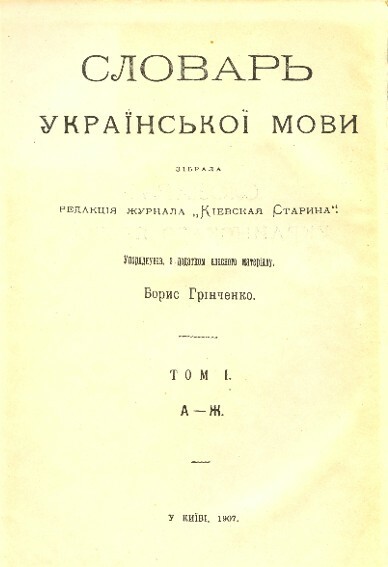 His observations on the attitude of the peasants to literary Ukrainian as well as his arguments for the free development of the Ukrainian language were presented in the book Tiazhkym shliakhom (Along a Difficult Road, 1906; 2nd edn, 1912). 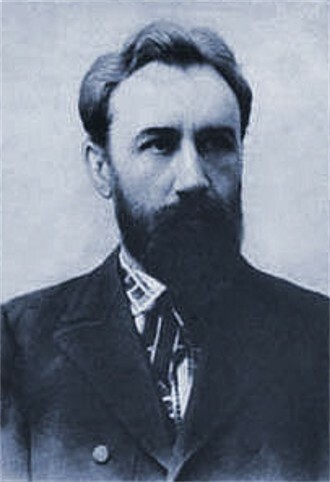 In the 1900s Hrinchenko took a more moderate position on Western Ukrainian elements in literary Ukrainian. The fullest collection of Hrinchenko's literary works is the 10-volume set published by Knyhospilka and the Rukh publishing house (1926–30). His important publicistic work, ‘Lysty z Ukraïny Naddniprians’koï’, was reprinted in 1994 as Dialohy pro ukraïns’ku natsional’nu spravu (Dialogues about the Ukrainian National Cause), compiled by Arkadii Zhukovsky and edited by Pavlo Sokhan. A referral to this page is found in 68 entries.